Life is life, no matter where you live. That's something I learned living abroad. If you live in any one place for a period of time, the excitement of the early days changes to a routine of living the everyday. The new becomes familiar. Work is, well, work. And at some point you need a break. One of our favourite places to run away to while living in Switzerland was the Ticino region in the Alps, near the Italian border. This was especially true when the winter blues were dragging us down. A few hours on the train from snowy and grey Zurich and we would find ourselves in a quiet, charming town where we could relax. And breathe. Two days to escape, to dream, to lose oneself for a moment before heading back to the real world. Take the funicular to the 15th-century Santuario della Madonna del Sasso. Walk around for hours. Eat lunch on an outdoor patio in the company of two older gentlemen at a tiny restaurant high up the mountain. Watch the paragliders fly lazy rings through a brilliant blue sky. Wander through old ruins and sit in peace in a chapel. Join the rest of the town at the waterfront in the evening. 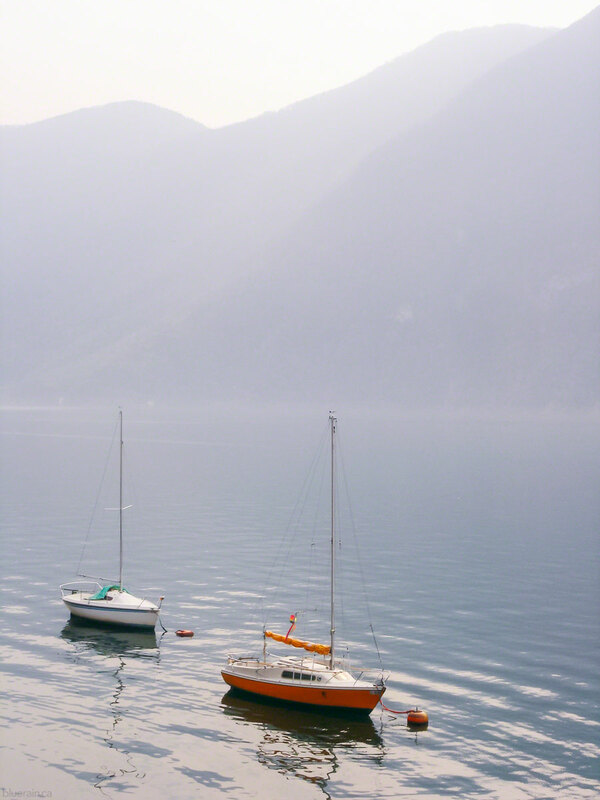 Rise early in the morning and walk along the River Maggia to Ascona. Enjoy a caprese salad in a sun drenched restaurant along the waterfront. Or amazing pizza at Ristorante Seven. Take the evening boat back to Locarno. Watch the town lights twinkle across the water in the dark. Sit in the sunshine at a cafe with a cup of coffee in hand. Don't move for hours. Marvel in the palette of colours - red, orange, pink, yellow. No, make that crimson, coral, maroon. Peach, apricot, tangerine. Blush, fuschia, rose. Buttercup, turmeric, mustard. And the blues - skies, water, boats. Azure, cobalt, cerulean, indigo. Walk along the cliff path to Gandria. Enjoy the solitude. The quiet early morning mist. Ramble through the olive groves, up and down paths created by farmers tending their crops for generations. Listen to the gentle lap of water on the shore. Watch the rise and fall of boats. Get lost in the maze of streets. Take the afternoon boat back to Lugano.